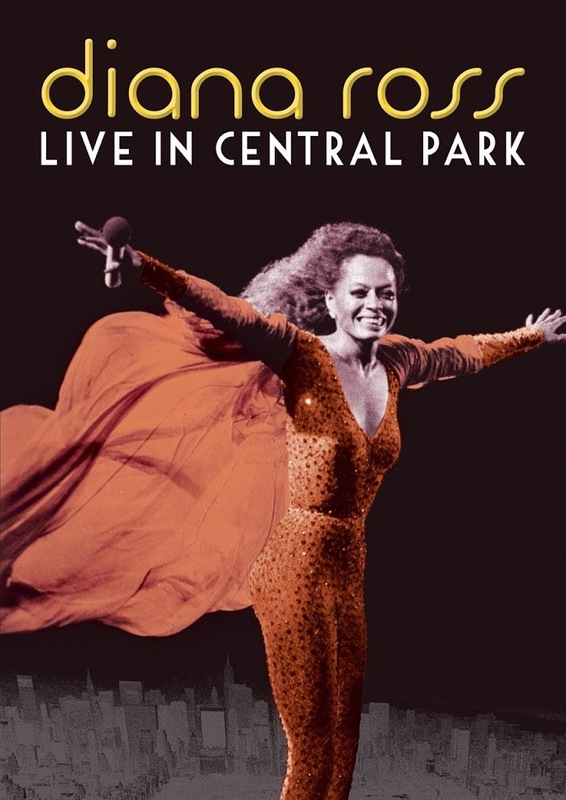 Article first published as Music DVD Review: Diana Ross – Live in Central Park on Blogcritics. On July 21, 1983, Diana Ross performed for approximately 400,000 fans in New York’s Central Park. The show was being taped for live broadcast on the Showtime network. As Ross took the stage for an elaborately choreographed opening number, the wind was beginning to blow pretty hard. After a few numbers, the late afternoon skies turned dark and rain began hammering the immense crowd. Completely drenched in the downpour, Ross continued singing–apparently in total denial that, despite careful planning, the concert was a lost cause. Throughout the truncated concert, Ross tries very hard to maintain her composure. A few terse commands to offstage assistants betray the frustration (if not panic) she felt as the situation worsened. This was no light drizzle, it was a full blown thunderstorm and everyone there was in potential danger. After about 45 minutes, it was announced by the singer herself that everyone needed to go home. “We’ll do it again tomorrow,” she promised, without knowing whether or not that was indeed possible. As the assembled throng slowly made its way toward the exits, Ross remained on stage, imploring everyone to exercise as much caution as possible. Thankfully, no one was hurt. By some minor miracle, Ross and company returned the very next day. The weather was beautiful and a full concert was performed without a hitch. Nearly 30 years later, both shows are presented in their entirety for the first time ever on Live in Central Park. The rain-shortened first concert is a fascinating example of grace under pressure. Ross, who contributed new liner notes for the release, was very brave to allow its inclusion. It’s a rare look at a superstar enduring very undesirable and unflattering circumstances, singing off key at times as the elements drown out any possibility of hearing the monitors. The triumphant full concert is all the more enjoyable after watching the disastrous rain-out. Ross’ energy is boundless, reckless even, as she nearly biffs it while running up some stairs backstage while singing the opener, “I’m Coming Out.” The crowd seems to be having as grand a time as she is, basking in the hot July sun and singing along boisterously. The staging is endearingly primitive by today’s standards, with Ross making some of her costume changes right onstage as the band plays. She almost trips while trying to take off what looks like oversized pajamas. This is clearly a live performance, with no post-production sweetening to clean up occasionally sour vocals. Among the many predictable hits in the set list, such as a Supremes medley, “Endless Love,” “Reach Out and Touch (Somebody’s Hand),” and “Why Do Fools Fall in Love,” are a couple of less expected covers. Michael Sembello’s then-contemporary “Maniac” (from the movie Flashdance) gets a workout, complete with a choreographed dance routine. Ross received a big cheer as she launched into a short version of Michael Jackson’s “Beat It,” but even though she assures the crowd, “You know how much I love Michael,” she didn’t know this song very well. Even more surprising is when she blanks on the lyrics to her own smash, “Upside Down.” She tries to play it off by flirting with the hoard of police officers providing security. Whatever flaws there may be only makes the performance that much more genuinely endearing. By the end of the show, the legendary performer is moved to tears, clearly overcome with emotion in front of 400,000 fans. Kudos to the DVD producers (and Ms. Ross herself) for including both shows. The rain-shortened concert includes an informative audio commentary by the director, Steve Binder. All these years later, Binder has a great memory and is able to share many details about the concerts. Live in Central Park is essential viewing for Diana Ross fans.